Přiznám se, že s finskou skupinou ORDOG jsem se doposud nesetkal, a to už mají tito pánové na kontě čtyři řadové desky a víc jak deset bohatých let na scéně. Kdepak. Jejich tvorba není ani na aktuálním počinu „The Grand Wall“ nikterak zázračně okázalá a originální, ovšem provedení ryzího death-doom metalu je natolik vábivé, že dokáže snadno zalomcovat i s přísnějším milovníkem tohoto žánru. „The Grand Wall“ je o melancholickém „Suomi know-how“, chladu, hrubiánství a záblescích světla. Začátek alba v průvanu exkluzivity! „Open the Doors to Red“ může s hrdostí pozvednout vlajku finského death-doomu a svým pojetím baví už po deseti vteřinách. Pokud máte někdy problém se vpravit do neprostupných hloubek vybraných death-doomových nahrávek, tak toto zde odpadá. ORDOG jsou zkrátka hodně líbiví, ale není to na úkor utnutí brutality a hutnosti. Houslové obkreslování kytarových melodií je v úvodní kompozici brilantní. I bez ohledu na stín tradičnosti. Následující „Sundered“ působí mnohem syrověji a žánrově se přibližuje spíše melodickému death metalu, byť hodně (a hodně moc) valivému. „In the Looming Bitterness“ posléze pokračuje v nastoleném trendu a zároveň rozšiřuje arzenál prostředků, kterými lze výše uvedené hudební odvětví prezentovat. Skvěle působí především klávesové party i klavírní vsuvky, povšimnout si lze i příklonu k formě klasické písničky – alespoň tedy u této skladby. OrdogV druhé části kolekce se ORDOG opětovně vrací k tématu úvodní skladby. Valivá doom metalová hudba s ingrediencemi death metalu, dává vzpomenout na zlatý konec devadesátých let – tentokrát za přispění modernějšího zvukového pojetí. Plusovým bodem pak rozhodně zůstává schopnost vystavět pestrou skladbu bez nutnosti opisování od „slavnějších sousedů“. Nejostřejší skladbou, a řekněme tou nejméně nápaditou, je „Wings In Water“, která mi svou atmosférou připomíná cosi z alba „Elegy“ (hádejte od koho). „Šestka“ a závěr kompletu se však ORDOG povedl opětovně na jedničku, neboť titulní kompozice představuje pravou severskou elegii doom metalu. Letargicky čistý vokál v úvodu sice může na někoho působit poněkud těžkopádně, avšak smysluplnosti je učiněno zadost v navazující druhé části. Ke slovu se znovu hlásí housle, jež nádherně prostupují syrovými kytarovými riffy, přičemž dostatečně přirozeně působí i baladické proluky takřka ambientního charakteru. Skutečně velmi vydařená záležitost… takhle na samotný závěr. Finové ORDOG jsou pro mě velmi milým překvapením. 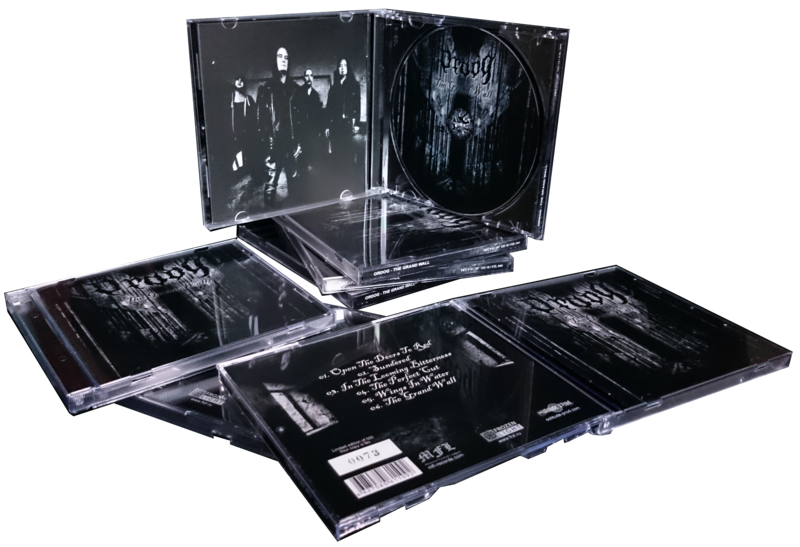 „The Grand Wall“ prezentuje pravou tvář skandinávského doom metalu, nenásilně, čistě, přirozeně. Z nahrávky mám dojem, jako kdyby klukům nedělalo problém vytvořit kvalitní „hitovku“, např. takovou, o kterou se mnozí další snaží celé roky. Nevím, jak to ještě nejlépe popsat, ale ORDOG jsou zkrátka ti šťastní, ti, kterým bylo shůry dáno. Pro fanoušky žánru vhodná alternativa po všech stránkách. Earlier today I asked our readers to share their nominees for our list of the year’s “Most Infectious Extreme Metal Songs”. I have my own big list of candidates, and the album you’re about to hear is home to multiple songs on that list. The album’s name is The Grand Wall, and it will be co-released by Solitude Productions, Moscow Funeral League, and Frozen Light on November 21. This is the fifth album of the Finnish doom/death band Ordog, but for me it’s my introduction to Ordog’s music — and a hugely compelling introduction it is. As you’ll see, the band describe the album as “more aggressive compared to the previous ones”, but with melancholy going hand in hand with the aggression. As I listened to it, I thought it would appeal to fans that cut across the swath of such groups as In Mourning, October Tide, early Paradise Lost, and even Bolt Thrower. It’s an earthshaker and a headbanger, and on the other hand, it’s also deeply (and hauntingly) entrancing. I mentioned earlier that the album is home to some of my own candidates for “most infectious” songs of the year, and perhaps the leading contender is “In the Looming Bitterness“. It’s one of several up-tempo tracks on the album, a big, lumbering, hard-grooving, imminently headbangable, death metal stomp. But as in the case of other tracks, it also includes an eerie, ambient keyboard chorus melody that shimmers above the skull-cleaving core of the song. And with two minutes left at the end, the band introduce a beautiful, memorable piano melody that elevates an already gripping song to an even higher plane. The song also features another key component of The Grand Wall’s great appeal — the deep, gravel-throated, meat-eating growls that are the dominant vocals in the songs, the kind of monstrous yet well-rounded sound that may put you in mind of the likes of Johan Hegg, Karl Willets, Tobias Netzell, or Tomi Joutsen. To accent moments of special intensity, you’ll also hear a different style — venomous, demonic snarls and shrieks capable of putting the hair up on your arms. And while we’re on the subject of vocals, the album’s immense title track also includes affecting clean vocals with a gothic air that suit the dark and dreamlike three-minute introduction to that fascinating track. “In the Looming Bitterness” isn’t the only highly infectious song on The Great Wall. One of the album’s strengths is that it’s loaded with memorable melodies and bone-shaking riffs and rhythms. But you’ll also discover how much variety the album presents through its six long songs — five of which are roughly in the 7-9 minute range, with the closing title track nearly reaching 11 minutes. “Open the Doors To “Red” opens the album with a warm, lilting guitar melody, only to bring the weight of earth-moving doom chords down on your fragile head. There’s something ominous, unreal, and even hallucinatory about the atmosphere of the song, due in part to the unexpected bursts of abrasion that intrude in the softer parts of the song. In some ways, it’s a challenging way to begin an album, but it’s followed by something even more unnerving. “Sundered” is a heaving, lurching piece of music for much of its length, with an oppressive, claustrophobic, even narcotic air. The slithering lead at the song’s start is downright queasy, as if someone is messing with your inner ear. But the song has surprises in store as well, including an unexpecedtly bluesy guitar solo, a swirling keyboard melody that’s spectral, and finally a supremely head-nodding groove in the song’s intense concluding section. The songs on The Grand Wall are arranged in a way that varies the pacing, and so that big pulse-pounder “In the Looming Bitterness” comes next — and it in turn is followed by “The Perfect Cut“, a slow, massive, and majestically mournful piece that’s on the edge of funeral doom. It also has its fair share of hammering grooves, but the song’s great strength is its tear-sodden melody, which soaks in and chills the skin, and a beautifully executed, extended guitar solo that fits the song’s grieving mood and yet is riveting in its vibrancy. Consistent with the dynamism reflected in the ordering of the album’s tracks, “Winds In Water” then accelerates the tempo. It’s a warlike, mid-paced gallop that builds tension and drama, melding a dark and ominous atmosphere with hard-driving propulsion. And then you come to that big closing track which shares the album’s name. The long first section of the song is moody and dreamlike, and includes a strange, pulsating keyboard motif that sounds almost like a squeezebox, along with those clean vocals I mentioned earlier. The main body of the song is heavy as hell, yet you never lose the thread of the core melody, which seeps deeply into the mind as Ordog spin off elaborations on the theme — straight through to the appearance of a piano near the end, which puts the icing on the cake. I have some concern that with this album appearing so close to the end of the year, and coming from a band whose name may still be well under the radar for a lot of listeners, it won’t get the attention it deserves. I hope that doesn’t happen, because it’s a wonderful album. No filler here, no wasted minutes, every song stands tall by itself, and the album as a whole makes for a richly rewarding listen from start to finish. The Grand Wall gode di una compattezza invidiabile e non c’è davvero nulla che non vada: ogni episodio scorre con buona fluidità, andando a costruire un insieme sonoro che verrà apprezzato non poco dagli appassionati del genere. ORDOG демонически накатали уже пять полноформатов, сабж — это и есть пятый. Финны — мастера медленного звукоизвлечения, это у них в крови, наверное. В стране у них холодно, все леденеет, и руки примерзают к струнам. Пока оторвешь — рифф длится очень долго. Потому и дум метал здесь очень популярен. Есть еще несколько обстоятельств, но об этом не сейчас. Вообще, с самого начала, когда ребята собрались более десяти лет назад, — была задумка играть просто дум метал, но как-то не сложилось (оказалось, к счастью), и начали ваять дум дэт. Это произошло, как вспоминают сами музыканты, на уровне промо III. А потом привыкли… Ну, из исторических изысканий еще можно припомнить тот факт, что в 2008 бандос ORDOG дал несколько концертов по России вместе с Throes Of Dawn. Пора заглянуть в душу сабжевому диску. Издала его известная контора Moscow Funeral League, которая пожелала иметь такой образчик музыкальной МАТЕРИИ у себя в списке. А ведь это намек очень толстый, особенно если учесть такие фюнерально прогрессивные релизы как Unmercenaries и Quercus, да и не только эти, собственно, у каждого релиза MFL Records своя карточка психической болезни. ORDOG наматывает обрывки души на финские оси почти 50 минут, и дается ему это тем труднее, чем депрессивнее и сугубо мрачнее становится повествование. И эту тяжесть замечает и взволнованный слушатель, решивший сделать попытку — попытку релаксации под многопудовыми риффами группировки. Начиная вполне пасторально, правда с невеселых нот прострации, ORDOG с лету ввергается в глубочайшую яму психоанализа, откуда не может почерпнуть ни добра, ни света, ни ясности. Это вполне традиционно прорисовано гитарным настроением, тяжким, дышащим, с добавлением легкого слоя клавишей, гроула и фонового чистого вокала. Однако далее композер все чаще и чаще обращается к своему психоаналитическому опыту, чем к стандартам дэт думового и фюнерального исполнения. Получается заметно и истребительно — так медленным огнем из ранцевого огнемета выжигается местная растительность и быстро нагнетается температура. Думово-дэтовый экстракт здесь свой, самобытный и хорошо структурированный, краями тяготеющий к гитарному прогрессиву, краями к наследию My Dying Bride и прочих. И если последнее обстоятельство меломана радует, то первое немало волнует )). Ибо струнник колдует своими пальцами над инструментом так, что получается почти «70-е прогрессивные», а иногда совершенно что-то модерновое, (не модерн металл) — такое, что искусно срежиссировано звукачами, — в итоге будто бы уже не стерео, а какое-то новое измерение звука. Уверяю вас, это не паранойя, а совершенно четкое ощущение, что звук выдвигается ИЗ ОБЛАСТИ МЕЖДУ колонок и мигрирует за вами. Иногда это пугает. Но в этом и была, вероятно, цель исполнителя. Стилистическая медитативность ORDOG иногда нарушается и близится к готико-детовым образчикам, замечаем это по ласковой тяжкой темповости, стремительности и напору, который обезоруживают и заставляют включать трак (In the looming bitterness) вновь и вновь. Стилевое разнообразие — исключительная сторона финнов, и даже исполняя нечто вполне trivia, они добиваются ошеломительного внимания, применяя клавиши а ля 70-е (опять что ли?) и тут же прорубая красивую мелодическую дорожку, чтобы вы смогли выбраться из этой дремучей финской тайги. Кстати, проговые олдовые клавиши здесь кое-где припрятаны в нижних слоях, но временами они вылазят ненароком, и это открытие заставит попереживать фанатов ORDOG. При всей форматности вокалиста (в самом положительном, естественно, ключе), голос Алекса обладает рядом отличительных черт — «нордичность» его местами сваливается в ненормированную взвинченность, отраженную в тембровом окрасе, интонации, а тем паче в эмоциональном взрыве — когда необходимо по его партитуре. Кстати, когда надо, ему помогает еще и басист, который отрабатывает на бэках (сообщают архивы), создавая в нужных местах настоящую вокальную феерию и почти вулкан страстей. Moscow Funeral League опять пустила в музыкальное обращение тяжелый кусок железа, опять адски не мимолетный, инфернально пылающий жаром искушенности исполнителей, наполненный гордыней уверенного музицирования. На мелочи не желает размениваться. Да и правильно действует, ибо ее релизы страшно далеки даже и от профильного мейнстрима, приобретая самодостаточную ценность и выстраивая мерцающий ореол сверхценности для своего лейбла. Ordog on nimenä nostanut päätään musiikillis-kulttuurisen maailmani laidalla useammankin kerran, mutta nimen taakse padotut ääniaallot eivät ole aiemmin lävistäneet kallokoppaani. Syy tähän on yksinkertainen ja banaali: bändin nimen assosioituminen myöhempien aikojen Black Funeraliin, jonka pääasiallinen funktio tuntuu olevan toimia Michael W. Fordin höpökirjojen myynnin edistäjänä, ei ole kauheasti houkutellut tutustumaan yhtyeen tuotantoon. Minun menetykseni selvästikin, sillä jo reilun vuosikymmenen ajan toimineella ja varsin vaikuttavan julkaisuhistorian omaavalla torniolaisbändillä tuskin on minkäänlaista yhteyttä edellä mainitun Fordin matalaotsaiseen kiipimiseen. Tarkastelun kohteena oleva The Grand Wall on järjestyksessään jo bändin viides täyspitkä levy, jonka lisäksi julkaisuhistoriasta löytyy myös kaksi demoa ja yksi kokoelmajulkaisu. Menneisyyden valossa onkin jollain tavalla yllättävää, että yhtyeen uusin levy julkaistaan verrattain vaatimattomana 500 kappaleen painoksena. Voisi hyvinkin olettaa, että kysyntä olisi tässä vaiheessa hieman toista luokkaa, olkoonkin niin, että pessimistinen ja sisäänpäin kääntynyt doom ei ole sitä kaikkein myyvintä tavaraa. Olivat painosmäärät ja myyntiluvut mitä tahansa, Ordogin viimeisin levy toimii omassa kategoriassaan todella hyvin. Bändin musiikki edustaa doom-genren modernia tulkintaa, joka ei kuitenkaan kumarra Albionin mailta tulevalle herkälle ja romanttiselle hempeilylle, vaan kallistuu pohjoismaisen kolkkouden ja kylmyyden suuntaan. Omanlaista ilmettä levylle antaa myös tietty kuolonmetallinen ja vihamielinen kulma, esimerkiksi kappaleessa Wings In Water. Lähestulkoon 50 minuuttia pitkältä levyltä ei löydy täytepaloja, vaan jokainen kappale on ansainnut paikkansa osana kokonaisuutta. The Grand Wall tuntuu myös tiivistyvän tyylikkäästi loppua kohti, sillä ainakin itselle levyn ehdoton huippukohta on levyn päättävä nimikkokappale, joka eteerisimmillään muistuttaa sittemmin lopullisesti Tuonen maille vaipunutta Unholya. Erinomaisen suositeltava hankinta kaikille itsetutkiskeluun ja synkkiin ajatuksiin taipuvaisille ihmisille. Ordog are from Finland and play death/doom metal. This is their fifth album. Okay, so let’s start this review off in no uncertain terms – The Grand Wall is a great album. There. I said it. The songs follow mournful, misery-drenched themes, as is the norm for this style of music, although Ordog seem quite happy to crank up the aggression when they need to. Due to the overall sorrowful atmospheres though, this is a negatively-charged aggression that keeps within the over-arching framework that the band have set for themselves. The singer’s deep growls are strongly performed and he has a really powerfully-delivered voice. Other vocalisations and low-key cleans are also used to good effect as the occasion warrants. Keyboards are used for added atmosphere and are embedded into the band’s sound rather than just tacked on at the end. When combined with the crunchy, heavy guitars it makes for songs that are very visceral and involving. Both the keyboards and the guitars are quite inventively played in the sense that there are some quite unusual and engaging sounds being made by the both of them, (more on this later). The songwriting on The Grand Wall is of a very high calibre. This is the band’s fifth album, so they seem to have learned a thing or two across the years. All of this has been poured enthusiastically into The Grand Wall, making for an extremely enjoyable album. I like that the songs are heavy mood-pieces that manage to be both massively crunchy and lavishly atmospheric. This is band that can do heavy, textured, rocking, nuanced and rich all at the same time. This, once again, shows the effective working relationship that the guitars and keyboards have. I can’t praise this music highly enough really. The band have created death/doom songs that manage to transcend the usual death/doom limitations in many ways. Due to this, Ordog are reminiscent of the way that Doomed also stand out from the usual death/doom crowd, (without either band sounding like each other particularly, which is quite an achievement, really, considering the limitations of the sub-genre). Although the music produced by both bands is of the death/doom style, both manage to do a lot more with the sub-genre’s inherent limitations than almost any other death/doom band. I really enjoy death/doom, but am aware it can be quite samey in places. Somehow Doomed have always managed to be an exception to this by using clever songwriting and injecting interesting ideas in their music. Now that I’ve discovered Ordog, I’m quite happy to make the same claims about them. The Grand Wall is catchy, memorable and very engaging. It’s a thoroughly enjoyable album that’s wrapped in melancholy and shot through with a firm aggressive streak too. Roel de Haan : Here we have the fifth full-length ‘The Great Wall’ by the gents of Ordog. An exponent of the Finnish doom metal scene. Starting out quite promising Ordog lost its momentum after their second album ‘Life Is Too Short For Learning To Live’. Slowly but inevitably they shed away their unique trait in favour of a more tried and true formulaic approach. Sadly they simply don’t excel in this style. So what about this ‘The Grand Wall’? Let me be clear: Ordog is not a bad band at all and this album is ample proof of their talent. The songs are heavy and massive, the melodies (sadly underused again) are quite stylish and the general atmosphere is quite decent. However, the songs tend to have too little contrasts and the contrast that are there often feel a bit misplaced. The addition of synths feels somewhat forced while the vocals are pretty standard for doom/death. Ordog seems unable to forge a unity from the individual elements they use as such the album lacks impact. Torniosta käsin operoiva Ordog yhdistää musiikissaan kuolon ja doomin melodisiin vaikutteisiin. Uutukainen ”The Grand Wall” on yhtyeen reilu 10 vuotta kestäneen taipaleen viides julistus melankolialle sekä epätoivolle. Albumi antaakin nimensä puolesta mielikuvan kolossaalisesta entiteetistä, joka ennen kaikkea pysäyttää pienen ihmisen, rajoittaen häntä kokemasta sitä, mitä toisella puolelta voi löytyä. Se voi olla sekä turvan, että sorron symboli. Ajatusta maistellessa ehti jo heti kättelyssä muodostua ennakkokäsitys siitä, miten tämä muovautuu itse musiikin maailmaan. Oletuksena on yltiöpäisen raskaassa muodossa ja olikin siten yllättävää kuulla, miten pehmeästi varsinkin nimikkokappale soljuu kliinimelodioiden ja tunnelmoivien kosketintaustojen kuljettamina. Äänimaailma levyllä on muutenkin odotettua orgaanisempi, mihin ei aina genressä törmää. Ordogin death/doom tekee siis sävellyksien osalta ajoittaisia irtiottoja. Pääosin meno on toki raskasta möyrimistä örinälauluilla, mutta välillä sekaan heitetään jopa pelottavan seesteisiä osioita puhtailla lauluilla. Ja sitten esim. ”Wings In Water” rikkoo hidastelukaavan kokonaan ja rullaa, melkein voisi sanoa jopa groovaavasti, telaketjuvaunun varmuudella maaliin. Vaikka lyriikat eivät mitään mieltä nostattavia ole, on levy musiikillisessa mielessä yllättävänkin pirteän oloinen. Tuntuu kuin yhtye ei varsinaisesti haluaisikaan vajota syvimpään alakuloon. Astetta raskaampi ote ei kuitenkaan olisi pahitteeksi. Matalilla taajuuksilla toki liikutaan ja välillä hidastellaan urakallakin, mutta kuivat, astetta kauemmas miksatut kitarasoundit ja välillä hieman heppoisen kuuloiset kosketintaustat syövät ikävä kyllä tehoa sieltä mistä sitä eniten kaivattaisiin. Äänimaailma tosin piristyy äänenvoimakkuutta nostamalla. Myös pienimuotoinen rallienglanti särähtää korvaan, ei niinkään örinöissä, mutta puhtaissa osioissa missä laulu saa tilaa. Muuten soitto kulkee varmalla otteella. Transitiot raskaista osioista kevyempiin tuntuvat myös toimivan luonnollisen kuuloisesti, mutta jotenkin vaihtelut biisimateriaalin välillä tuovat välillä olon, ettei bändillä ole täyttä konsensusta siitä, mitä halutaan ilmaista. Suurin ongelma levyllä kuitenkin on melko tasapaksu materiaali. Vaikka esimerkiksi ”Sundered” ja aiemmin mainittu”Wings In Water” jäävät hyvin päähän soimaan, turhan suuri osa levystä menee silti liian helposti ohi. Vaihteluakin on, mutta varsinaisia koukkuja viljellään välillä turhan harvaan ja ”The Grand Wall” kärsii ajoittaisista monotonisuuden hetkistä. Ordog väläyttelee kuitenkin potentiaalia viidennellä levytyksellään, eikä yhtyeellä liene tarvetta ainakaan musiikillisia peruspalikoitaan järjestellä uusiksi. Vaikka tämä muuri ei onnistukaan musertamaan uhriaan alleen pelkällä olemuksellaan, pienellä ehostuksella ja fokusoinnilla voi asian laita olla jo toinen seuraavalla levytyksellä.